N0HYD - QRP & Portable Adventures! : China heard on JT-65? Call 3T4CAV? 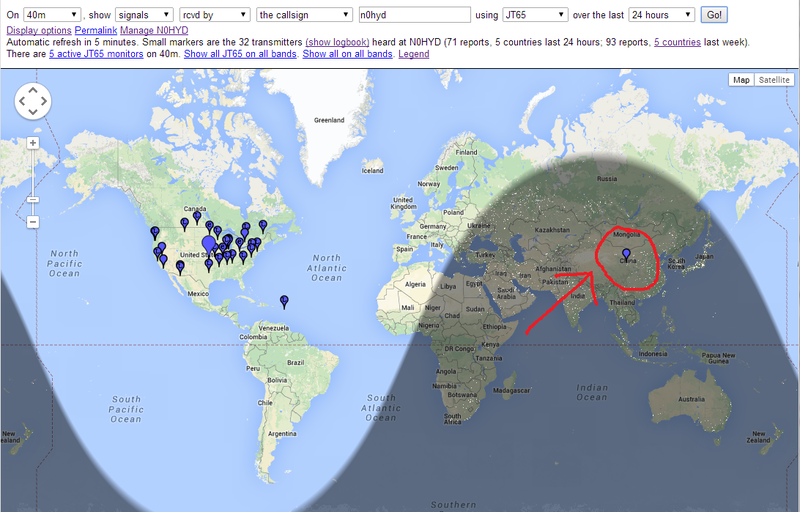 Did I really hear China on 40M JT-65? Last night I played around some more with JT-65. The band conditions did not appear to be as good as they were the other night. I was on both 20m and 40m. I worked a few stateside stations in the 40 minutes I played on the bands. When I looked at PSK Reporter this morning I was greatly surprised to see one of the stations that I had spotted. It must have been one of the very first decodes I had after firing the rig up. 3T4CAV - in CHINA! I can't find this call sign on any of the online databases, so I don't know if this is a mistake in the database, I guess I doubt it is, but this is pretty amazing. And the signal report was -5db - which is actually a pretty strong signal report on JT-65. I don't remember seeing the decode on my screen, but I could have missed it as I was getting everything configured. Anyway, that is pretty amazing if true. Judging by the location of spots (both sent and received) around the country and down to South America, my 66' ladder fed dipole in the attic seems to be working pretty well for this mode. I do see lots of stateside stations working DX that I am unable to decode, so I think my initial feeling that receive is weak could still be true. But its not stopping me from having fun on this mode! Burke that is very nice work on JT65 for sure congrats! JT65 is great and I am enjoying operating it, mainly on 17m.